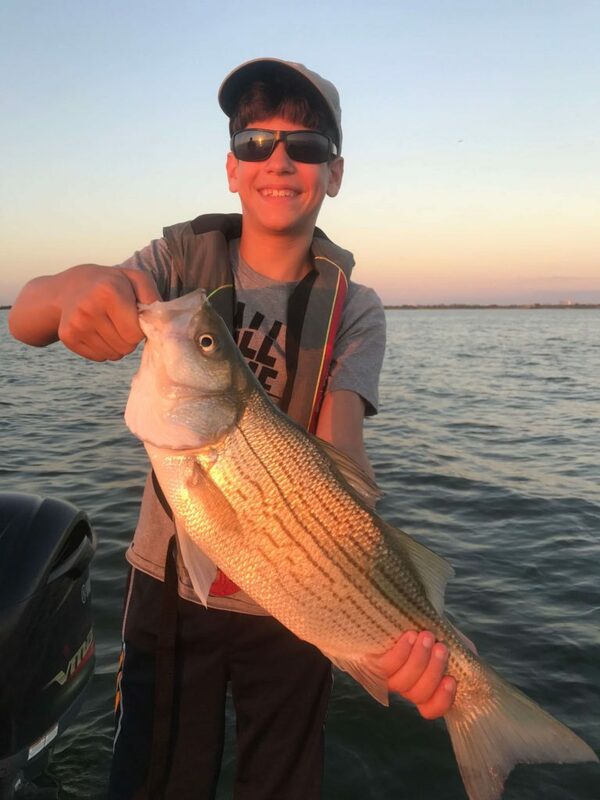 Lake Lewisville is well known as a great Sand Bass lake. Come fish with me and learn about the tackle and techniques for catching Sand Bass. 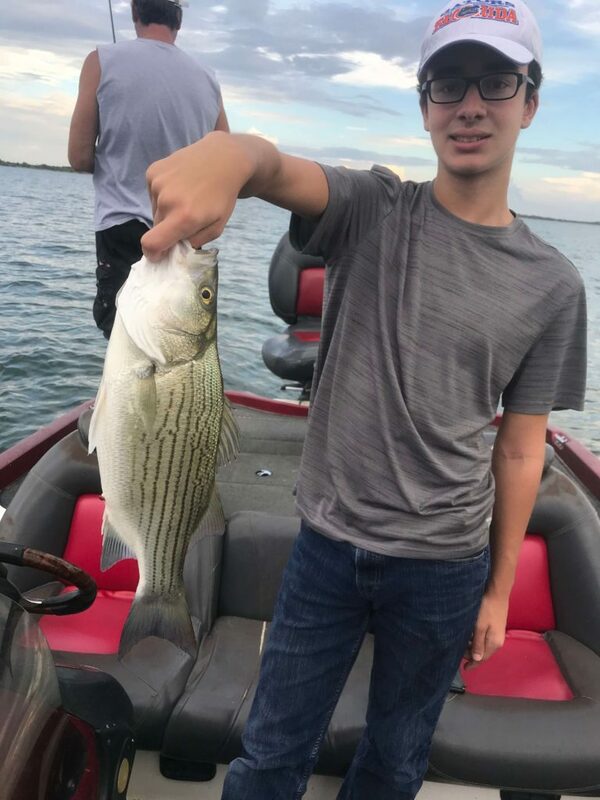 The Lake Lewisville Sand Bass run is on at Lake Lewisville and good numbers are easy to come by. Sand Bass are great eating and are easy to catch. The fish should move into a full spawn pattern on Lake Lewisville once the weather warms up a bit. 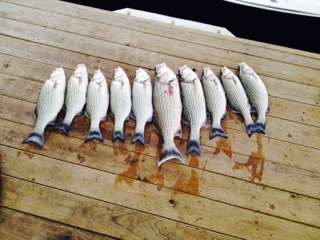 If you live in Dallas, DFW or North Texas and enjoy fishing schedule a Sand Bass trip today. 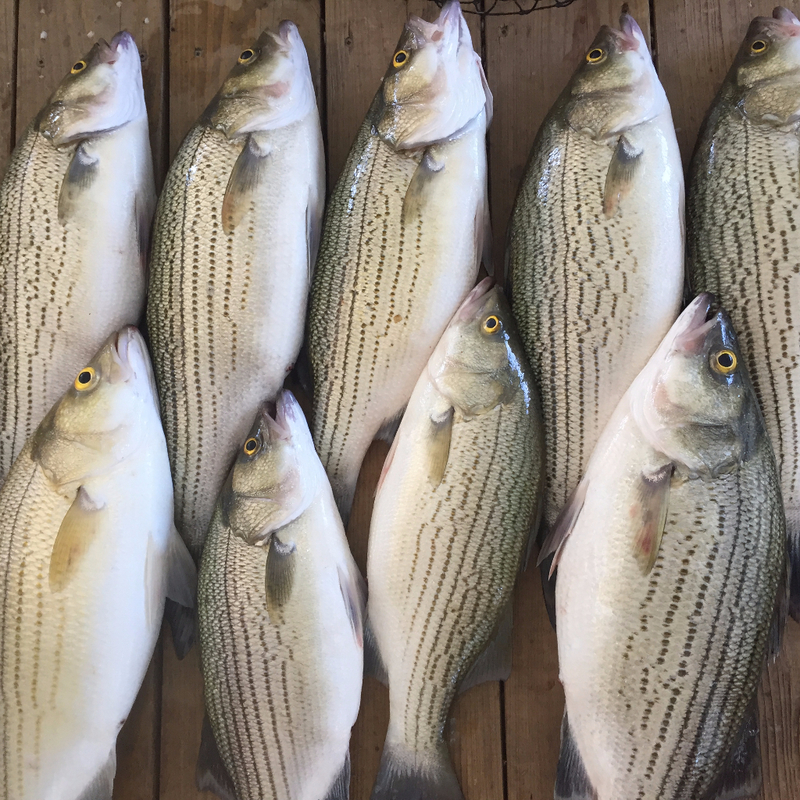 The Lake Lewisville Sand Bass Run should continue until May. Sand Bass bite is excellent. I am still getting easy limits on Sand Bass. 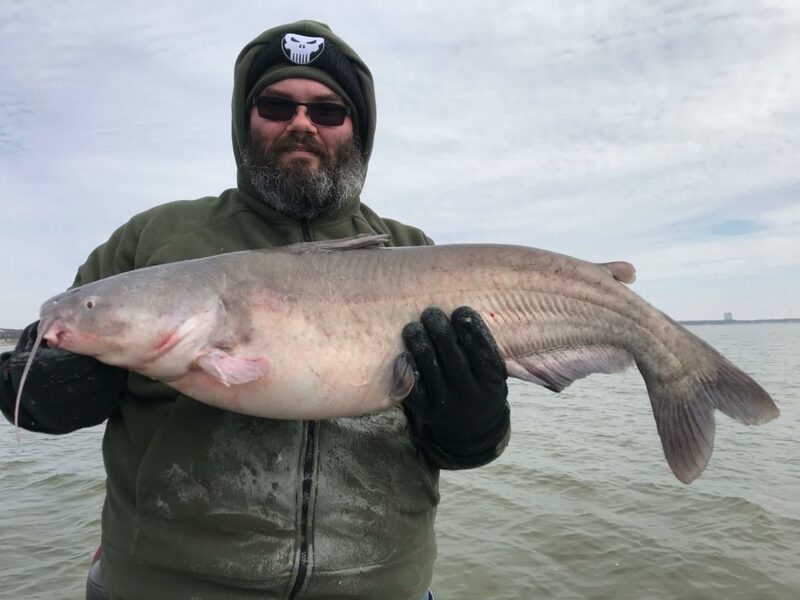 We caught some huge Blue Catfish last month. 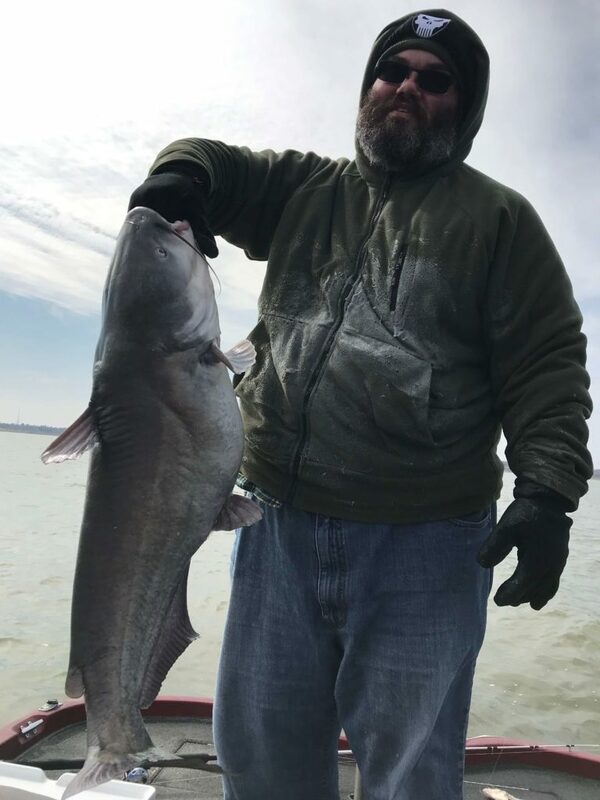 The Blue Catfish bite is excellent and should remain good while the temperatures are cool. The Crappie Bite should pick up soon. 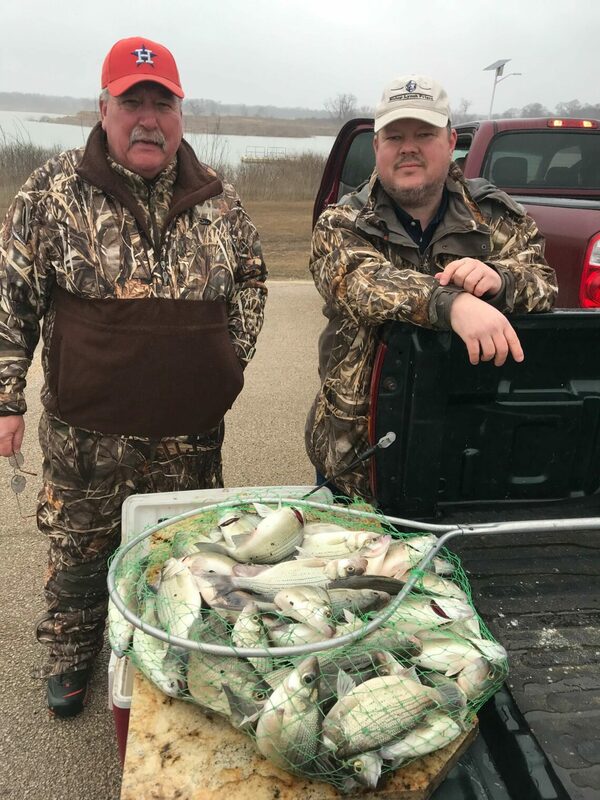 Warmer springtime temperatures will bring the crappie bite. 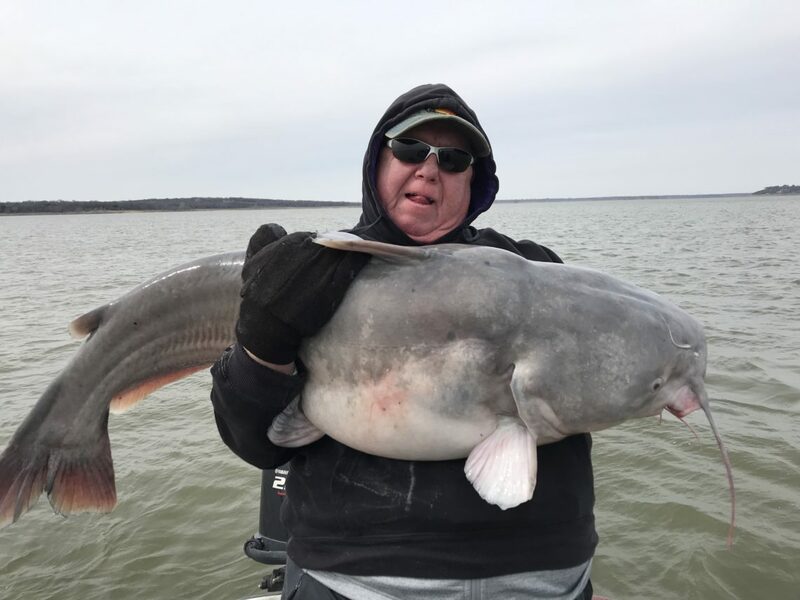 It was another awesome week of Blue Catfish fishing at Lake Lewisville. 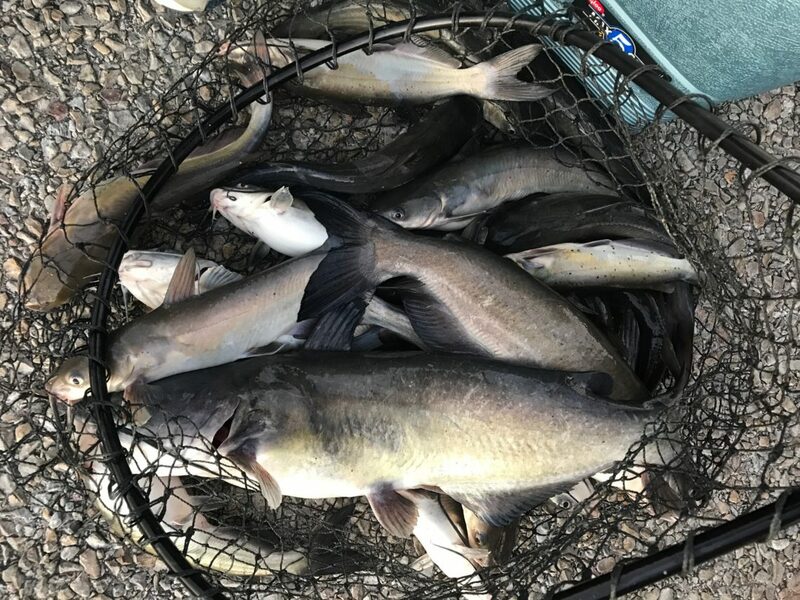 Fishing is very productive right now for Blue Catfish and Sand Bass. On Monday we had one fish over 55lbs and one fish around 50 and then 10-12 in the 20 plus range. 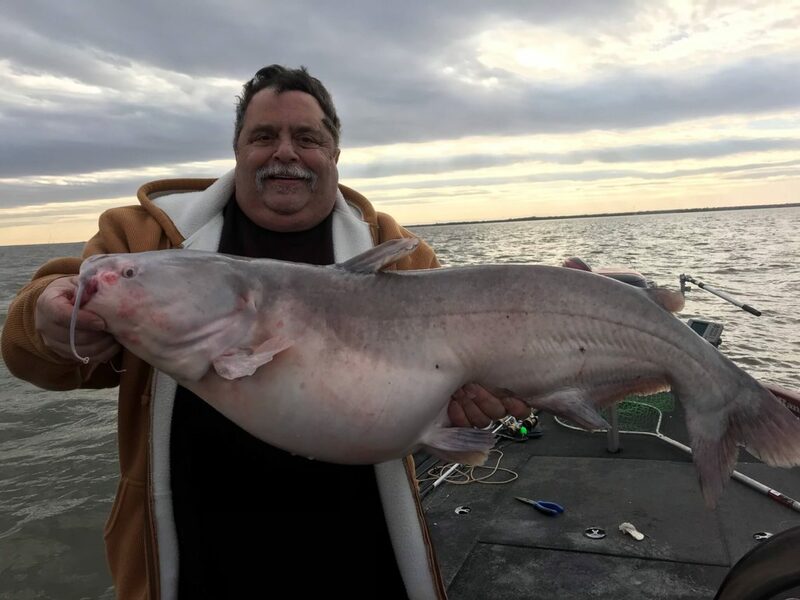 If you’ve been waiting for the best time for a Trophy Blue Catfish trip book now. 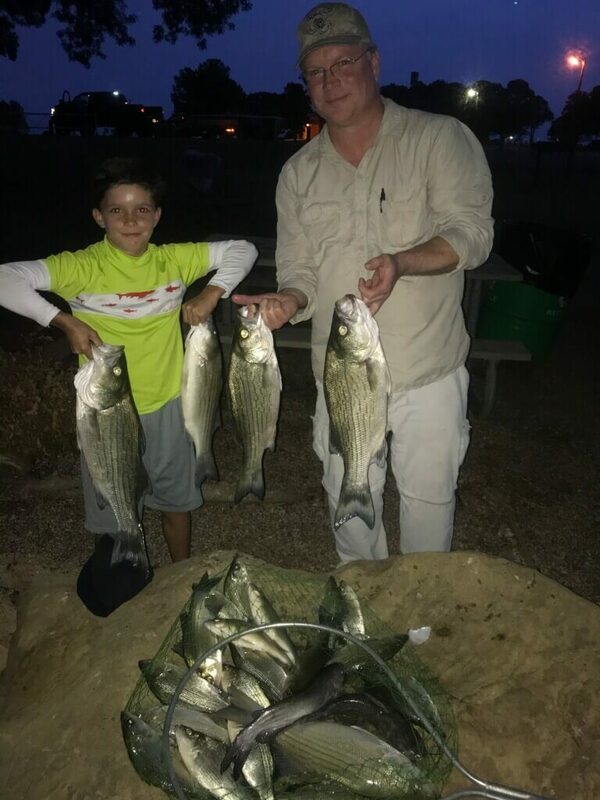 Sand Bass fishing at Lake Lewisville has also been good. The Sand Bass bite is extremely good also. Limits on Sand Bass are easy to get right now. 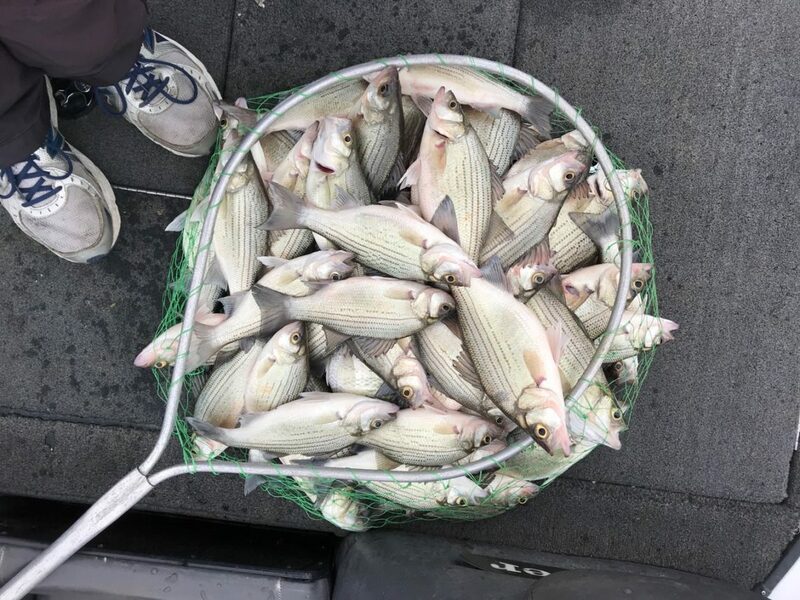 Sand Bass are currently in a pre-spawn pattern on Lake Lewisville and are in a pre-spawn pattern. The weather next week is looking good for more great fishing. 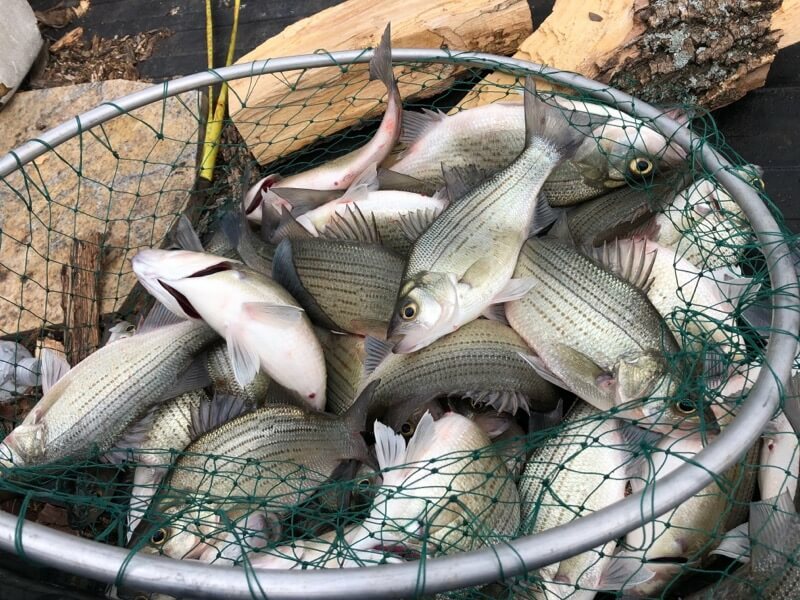 Blue Catfish and Sand Bass will be the best bite next week. Fishing should continue to improve as spring approaches. If we can get some very calm days, crappie fishing should pick up. Largemouth Bass will be moving into pre-spawn any day. Pre-spawn for Largemouth is usually when I catch the trophy fish. Bookings are picking up, so if you have special dates in mind for fishing, call now. Weekends and Holidays book up quickly, so don’t wait till the week before. 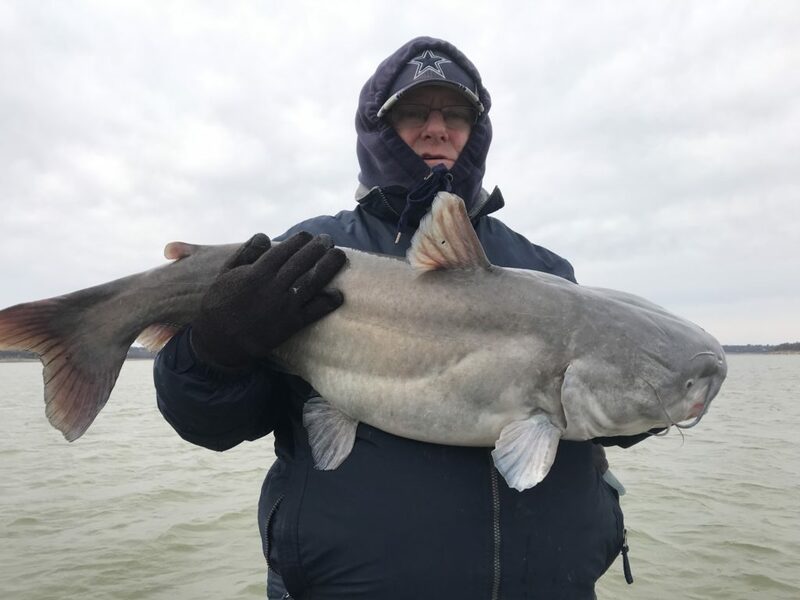 The Lake Lewisville Blue Catfish bite is definitely on. We caught over 500 pounds of Blue Cats today. All the monster catfish were caught and released. 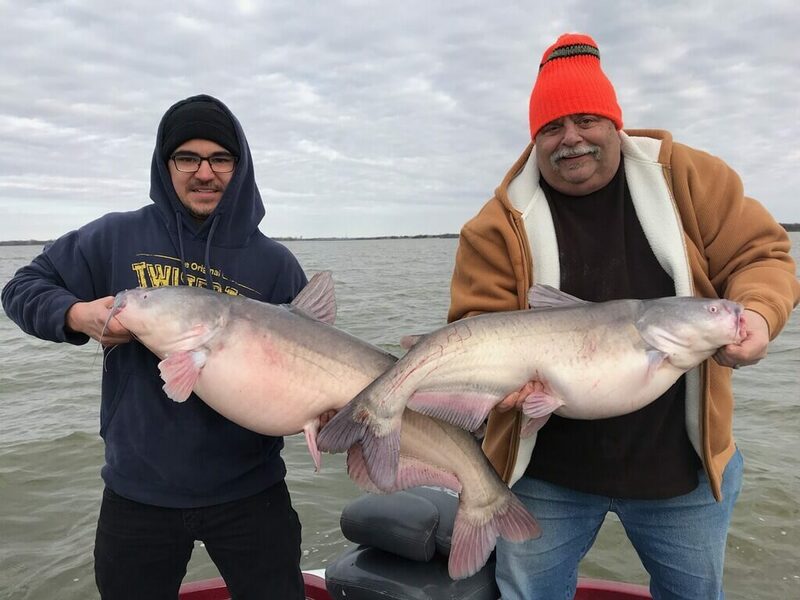 Blue Catfish offer an excellent opportunity for catching a large fish right here in North Texas. My two clients will be hurting tomorrow after reeling in fish after fish. 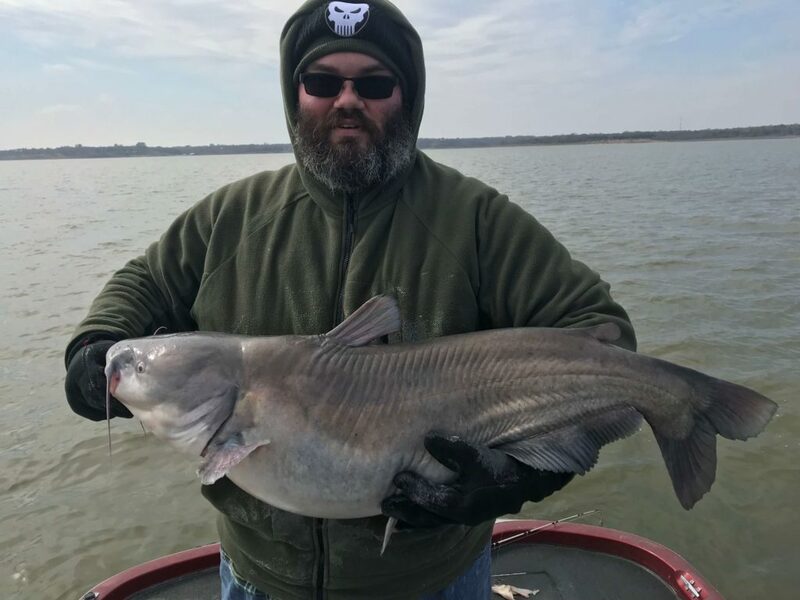 If you are looking for a big fish experience right here in the DFW area, call to book a Blue Catfish trip. The Fish today were in the 20 – 50lbs range. Sand Bass bite is also strong right now. Sand Bass are great eating fish and I am on limits of Sand Bass. 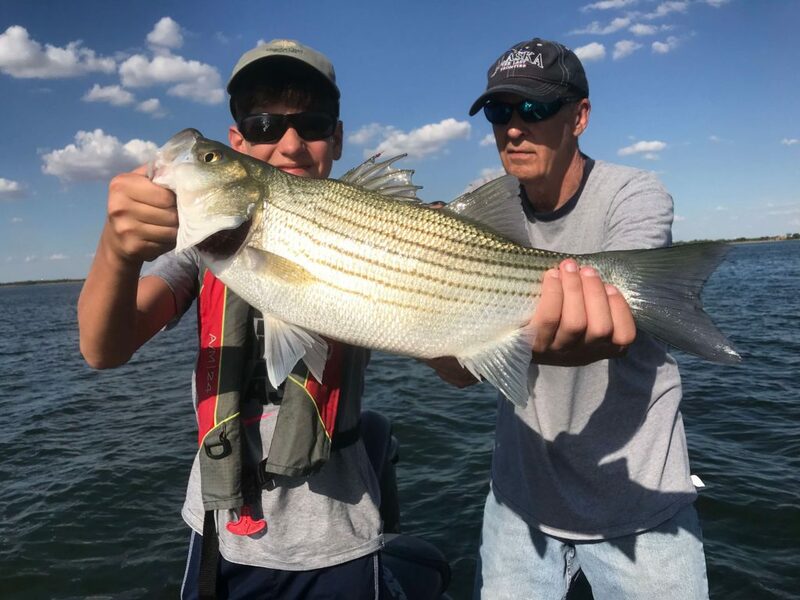 I also offer guided Fishing Trips for Hybrid Stripers, Crappie, and Black Bass. The Black Bass pre-spawn should start any day now, so call now to book for Black Bass. Some of the best fishing in Dallas is for Sand Bass. 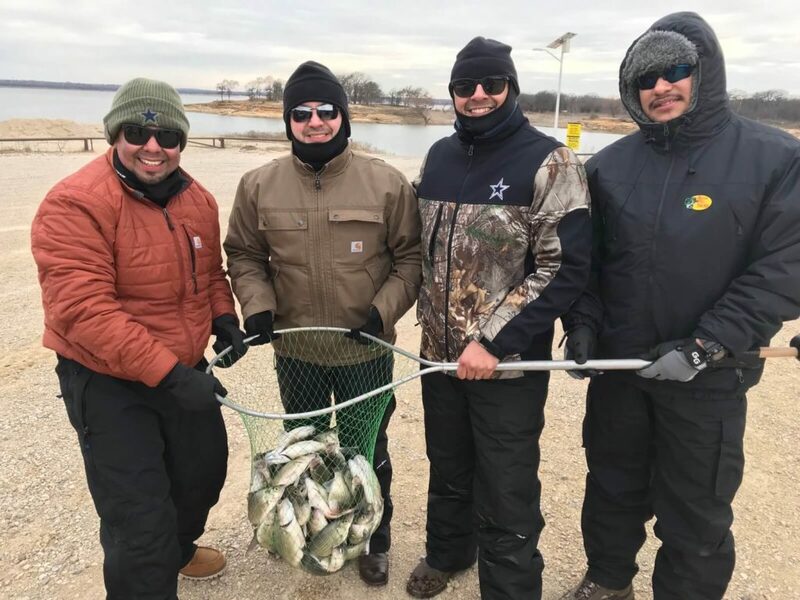 During the cooler months of winter, easy limits of Sand Bass can be caught on Lake Lewisville. 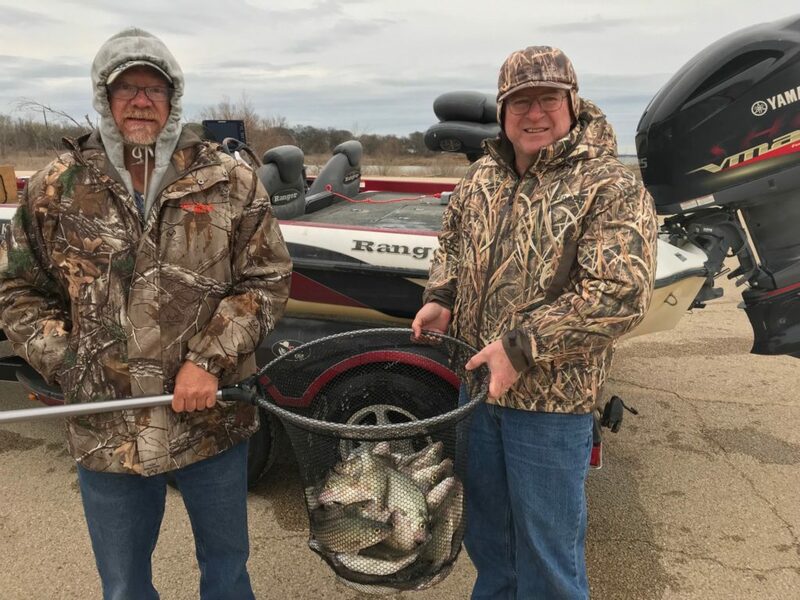 Lake Grapevine and Ray Roberts are also great Sand Bass lakes. 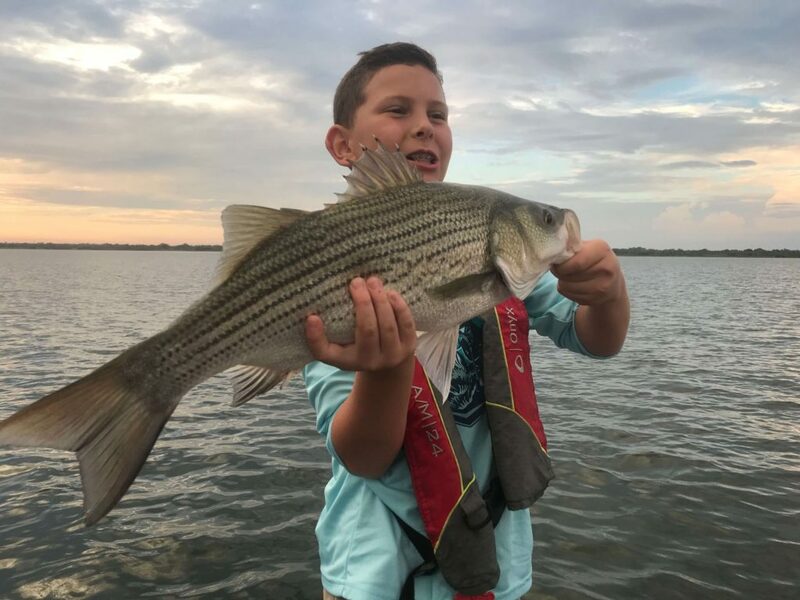 The Dallas and DFW area offers Sand Bass fishing year round. 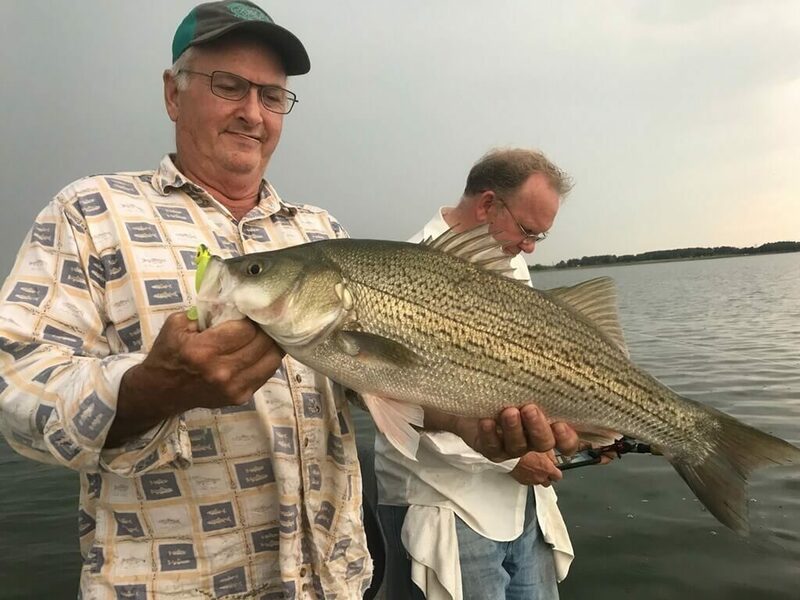 Sand Bass, Trophy Blue Catfish, Crappie and Large Mouth Bass offer great angling. 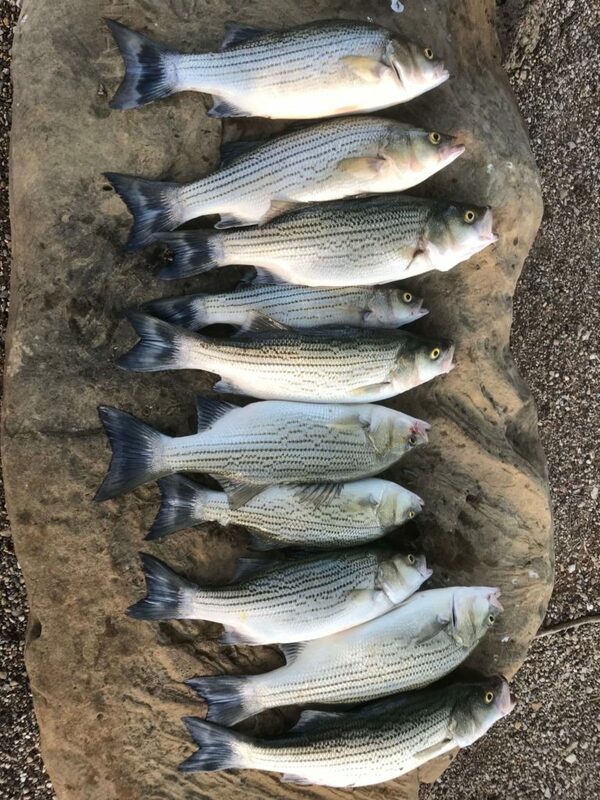 Today was a Sand Bass trip on a Dallas area lake. The high today was 37 degrees and the bite was strong. We fished the submerged structure in around 20 foot of water. If you would like to learn to fish with artificial lures and want to learn how to locate fish under different weather conditions I can teach you the tricks. Fish are cleaned and bagged for tips. I offer half day and full day fishing trips. Call for rates and availability. Another awesome day of fishing on Lake Lewisville Texas. 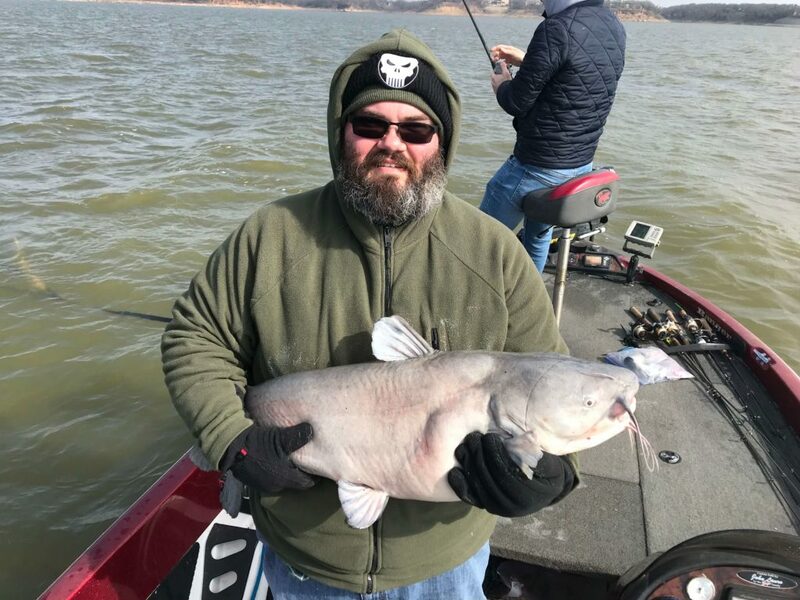 We caught multiple trophy-size blue catfish in the 40-pound range. 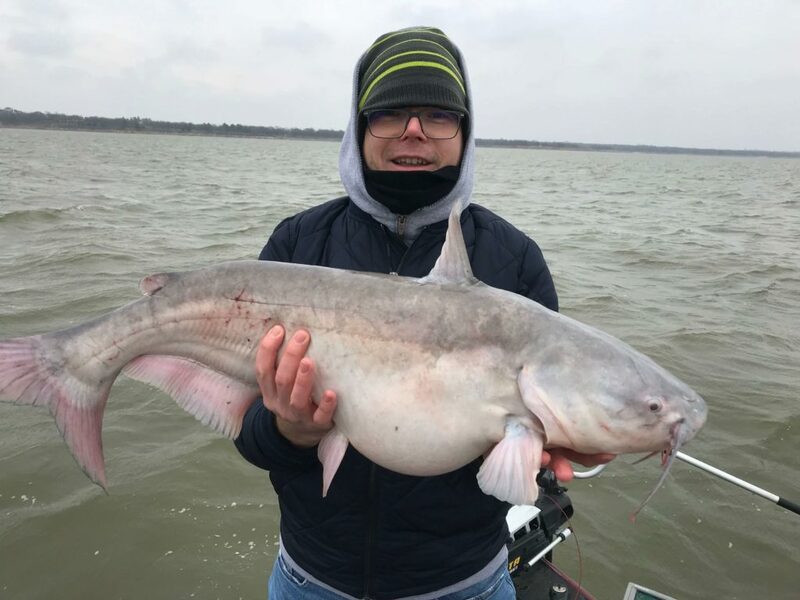 It’s been a while since the Blue Catfish have been this good out at Lake Lewisville. The bite is strong, sometimes with more than one fish on at once. 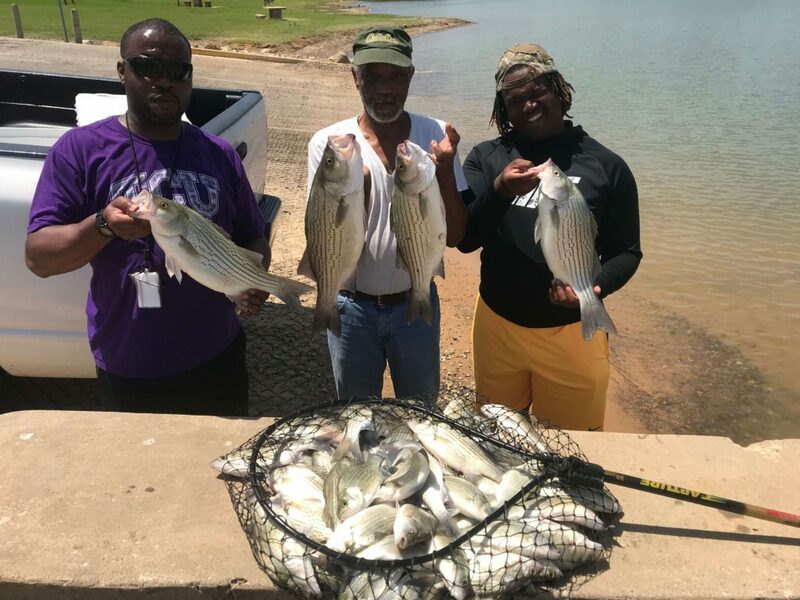 The weather has been perfect for this type of fishing at Lake Lewisville all week. 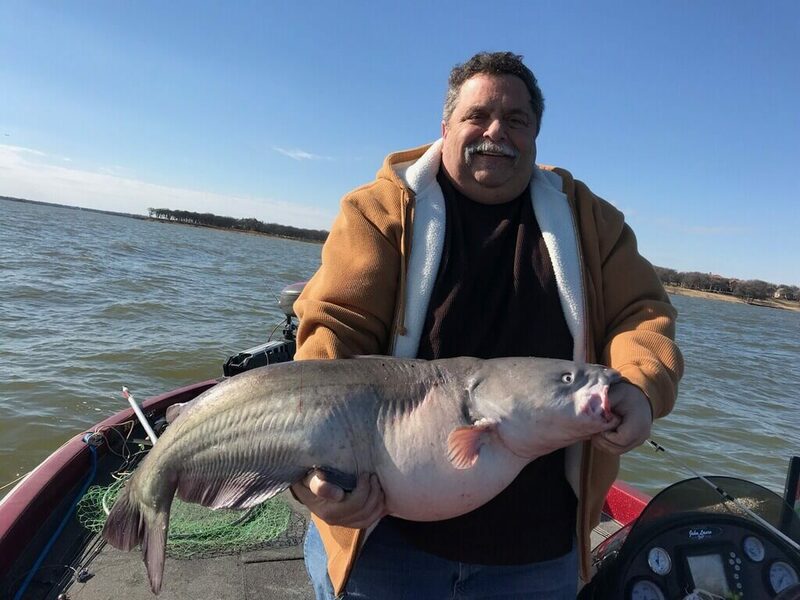 If you’re looking for the fishing experience of a lifetime book a guided Blue Catfish trip today. I also fish for Sand Bass, Hybrid Bass, Black Bass, and Crappie. I am expecting the crappie fishing to pick up in the next couple of weeks. 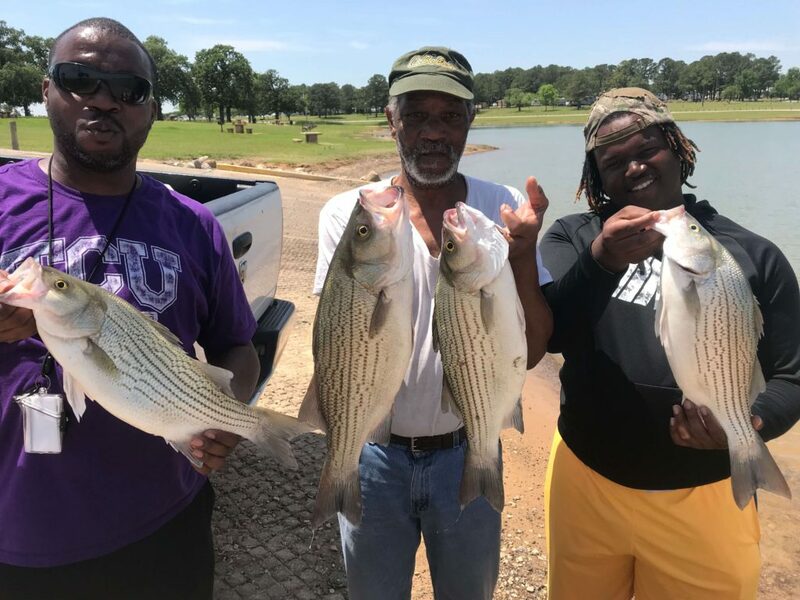 Book now for Blue Catfish, Crappie and early spring Black Bass. Texas Fishing for Fall Hybrid Bass fishing has been good. The weather has taken a turn for the better and fishing is comfortable. 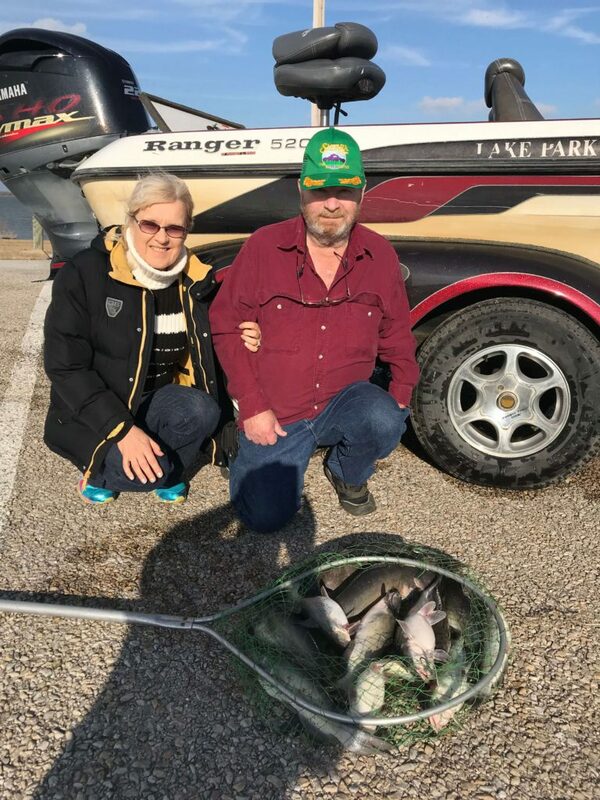 As cooler weather approaches pleasure boaters and jet skis disappear from the lake making Lake Lewisville Texas a prime fishing destination. The great weather can last all winter long in Texas. Hybrid Bass, Black Bass, Crappie and Giant Blue Catfish are all great in the winter months. The Pre Spawn for Black Bass will start in the late Fall to early Winter. 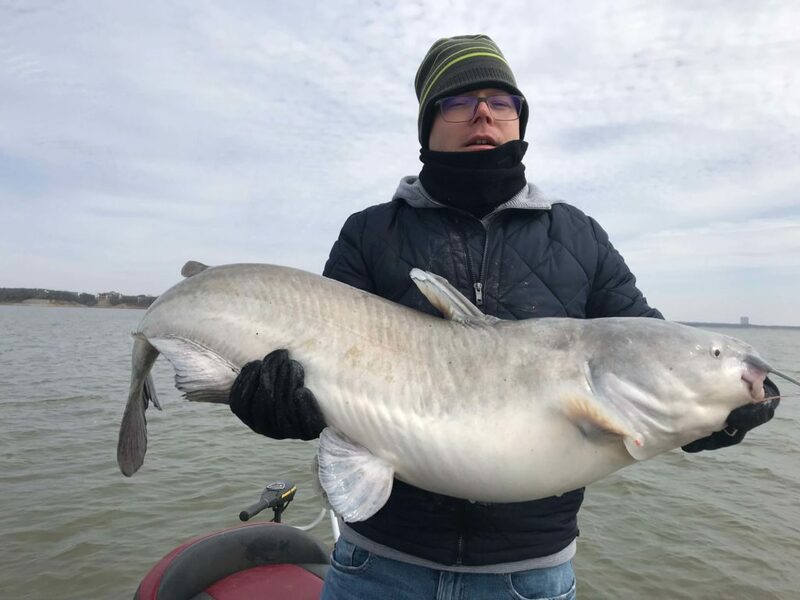 Blue Catfish are at their peak on Lake Lewisville from November through February. Crappie should start turning up after the first deep cold snap. The Hybrid Bass and Sand Bass are hot right now. Book far in advance for Crappie and Blue Catfish Trips. 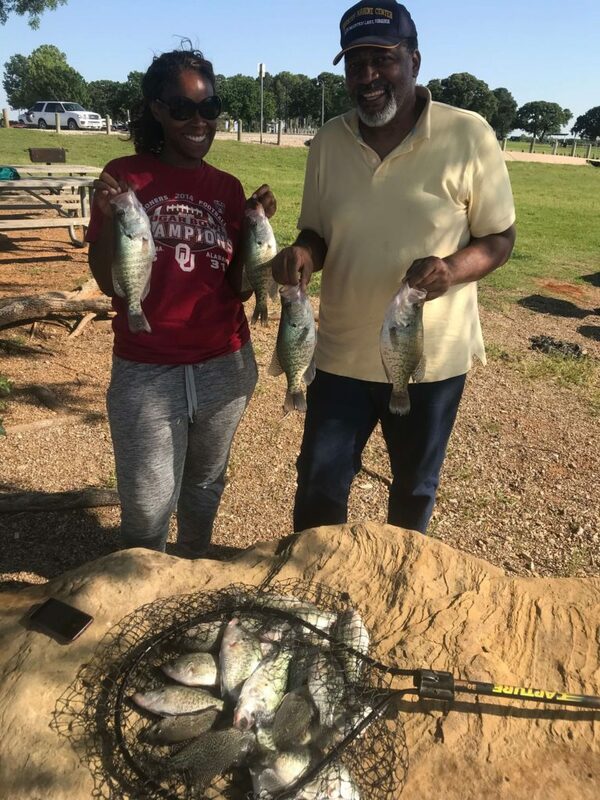 Enjoy all the great things DFW has to offer and get in some fishing at the same time. Fall and Winter offer the prime fishing conditions. 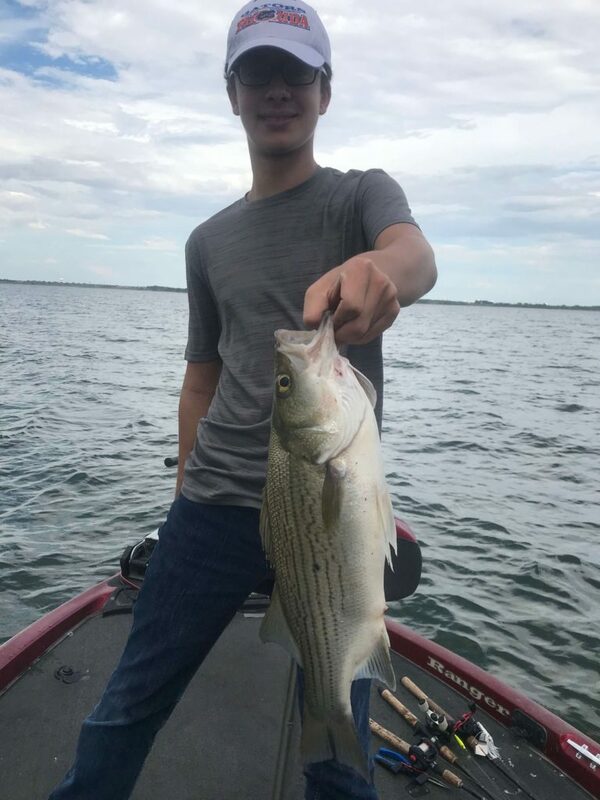 Summer Fishing for Hybrids and Sand Bass has been great this year. With fall and winter fishing just around the corner it will only get better. 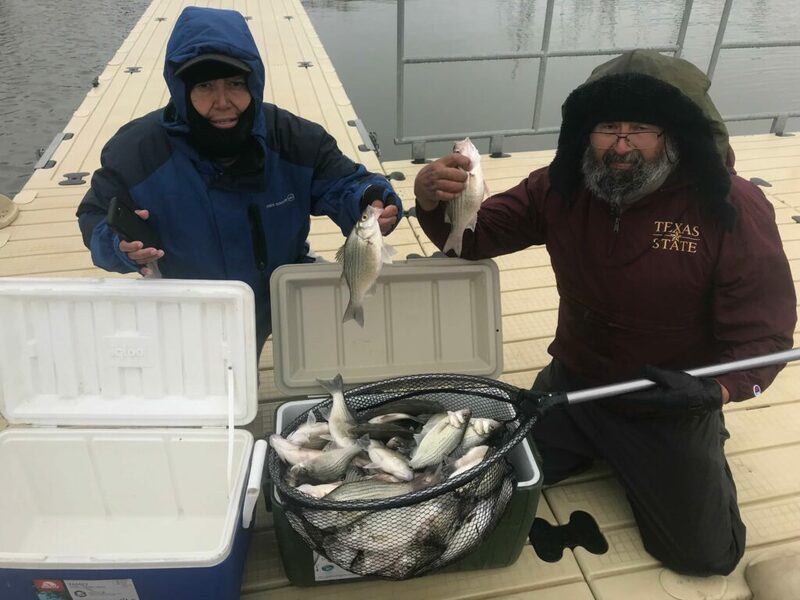 Fall and Winter offer some of the best fishing that Lake Lewisville has to offer. The cooler fall months usually bring Crappie, and continued success with Hybrids and Sand Bass. 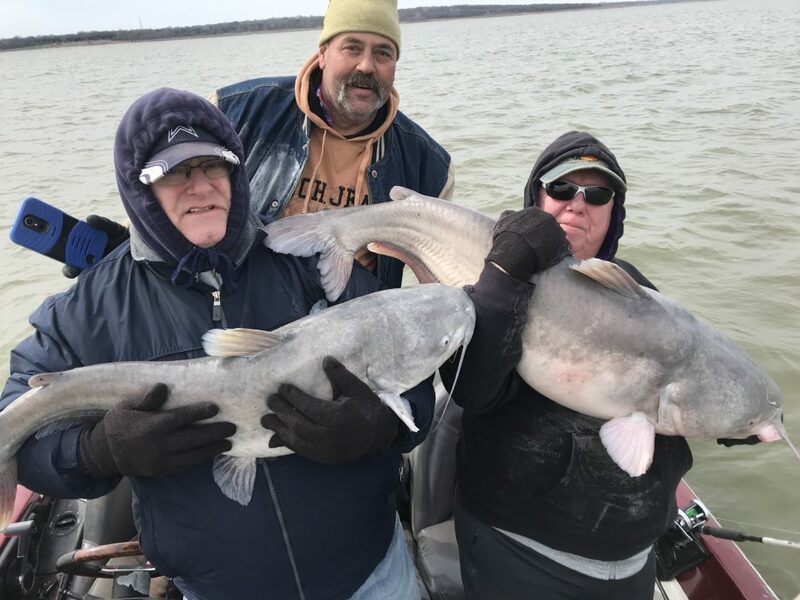 Into January and February Trophy Blue Catfish offer large fish opportunity’s. 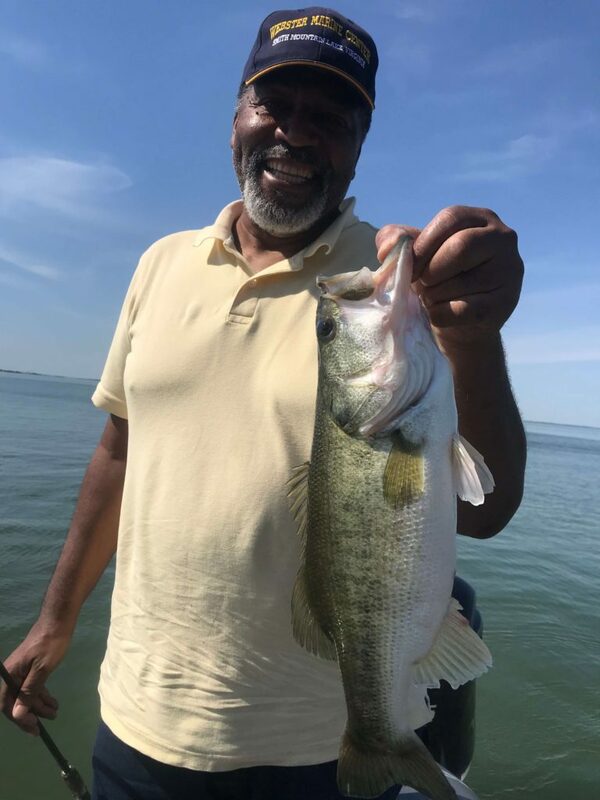 I fish all winter long on Lake Lewisville, I know how to catch the fish with the cooler water temps. If your looking to go on a guided fishing trip the winter months are a great option. There is less traffic on the lake and less competition for the best fishing trips. Come out for some great Sand Bass and Hybrid Bass Fishing with Fishing Guide, Steve Schiele. The fishing today was awesome. Crappie, Sand Bass, Black Bass and Hybrid Bass. This is Texas and Lake Lewisville Fishing at its best. When the fishing is good, it’s awesome. 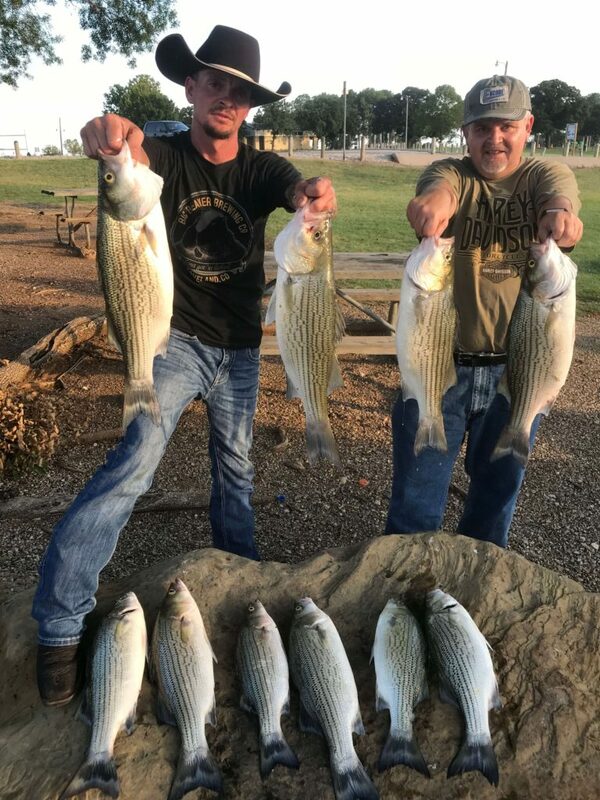 Not every North Texas guide can produce these results. I put fish in the boat, whatever kind of fish you’re after. Not all fishing guides can fish for multiple species. Not all fishing guides can provide the ultimate fishing experience yours after. If it swims in the lake I can catch it. Don’t be fooled by imitations choose a premium Lake Lewisville Guide Service for your next fishing experience. 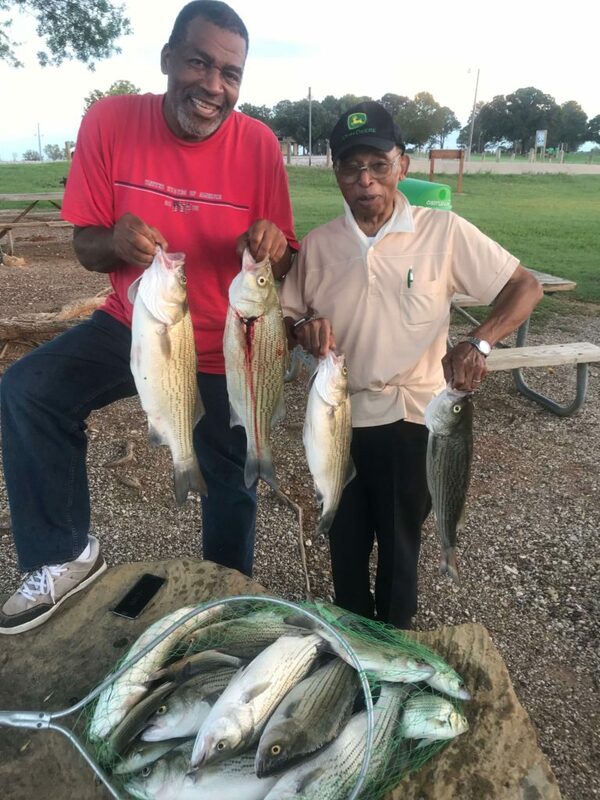 This is North Texas, Dallas, Lake Lewisville Texas Fishing at its best! A Lake Lewisville Guide that can put you on the fish.